You know that sensation, when you have bottomless power, breathing is deep, and pushing hard feels so good? When you are strong, motivated, and invincible. These are the days when you slay your training and smash your race goals. While there are many more accessory recovery techniques that can be used to complement nutrition and sleep, if you are not getting in the right nutrition and enough sleep, the accessory recovery techniques will have minimal advantage. You should focus your efforts on getting those two recovery habits perfected to get the most bang for your buck. For weekend warrior athletes training two to three times per week, following a normal daily nutrition plan with no special additions is sufficient for optimal recovery before the next training session. For athletes training once per day or more often, refueling for the next workout as quickly as possible is crucial. Refueling accurately and consistently after workouts will restore muscle and liver glycogen stores, replace fluid and electrolytes lost in sweat, promote muscle repair and bolster the immune system. Athletes who optimize post-exercise nutrition will perform better in their next training session and accumulate more high quality sessions than athletes skipping post-exercise recovery fueling. There are two post-exercise recovery fueling windows. The first is within 30 minutes of a hard or long training session. The second is in the two to three hours post-exercise. Short easy training sessions do not require special recovery nutrition. Athletes are best sticking to their daily nutrition plan with a normal whole foods meal after easy training sessions. Fluid, electrolytes, carbohydrates and protein are the foundation of proper recovery nutrition. Immediately on finishing a workout, start replacing fluid and electrolyte losses with a sodium containing drink or water plus sodium containing food. Estimate fluid losses by weighing yourself before and after training and drinking 16 to 24 ounces of fluid for every one pound lost. To restore muscle glycogen and promote protein synthesis, consume 0.8g per kg of body weight of carbohydrate and 0.2g per kg of body weight of protein within 30 minutes of finishing exercise. For a 70kg or 154lb athlete this would be 56g of carbohydrate and 14g of protein. Fluid, electrolytes, carbohydrates, and protein can be replaced with a commercial recovery drink, a homemade smoothie or with real food plus water. Additionally, antioxidants such as vitamin C and vitamin A, probiotics, medium chain triglycerides and L-Glutamine can shorten recovery duration and are good additions to a recovery drink or snack. Continue your recovery nutrition two to three hours post-exercise by eating a whole foods meal. It is OK to eat earlier than this if you are hungry but do not delay this post-exercise meal more than three hours. This meal should contain a combination of carbohydrate, about 20g of protein and some fat. Dividing daily protein intake into four or more 20g meals has been shown to have a greater stimulus on protein synthesis than two big meals with 40g protein per meal or 8 smaller meals with 10g per meal. A 20g feeding of protein is the sweet spot to maximally stimulate muscle protein synthesis. Studies have shown increasing duration asleep leads to increased performance and mental well-being in athletes. We also know chronic sleep debt impairs performance and reduces motivation to excel. Foundation sleep recommendations for adult athletes are 8 to 10 hours per night plus a 30 minute nap between 2 to 4 PM. I know that is a tough call for most athletes to achieve along with all the other responsibilities of life. Junior athletes need even more sleep with 9 hours per night plus a 30 minute nap in the afternoon. Along with sleep duration, sleep quality and sleep phase also affect the regenerative qualities of sleep. Sleep quality can be improved by reducing disturbances by wearing earplugs and sleeping in a cool, dark room. Following a pre-sleep routine of relaxing activities, avoiding light exposure from screens in the hour before bed, avoiding stimulants such as caffeine after noon and alcohol in the evening may increase your sleep quality and duration. 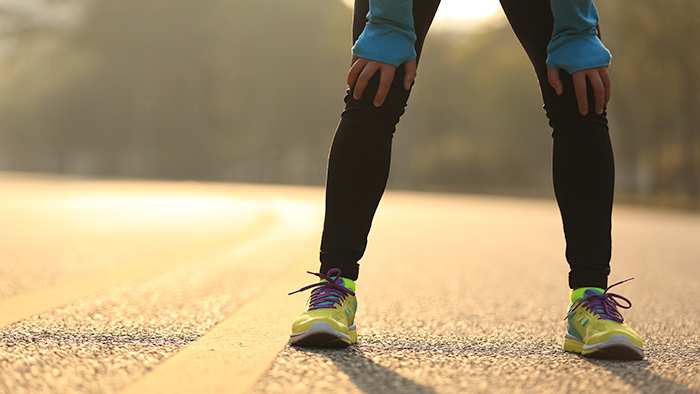 Restless leg syndrome can occur in athletes with low serum iron levels and disrupt normal sleep patterns. Exercising late in the day can make sleep elusive for some athletes. Summertime evening group training or local races make sleep especially hard to come by. Following up an intense evening session with inadequate sleep is a poor combination. Athletes losing sleep after these evening sessions are advised to switch their intense training sessions to the morning and put their evening hours towards lower intensity activities such as yoga, stretching, and massage. If you can measure it, you can improve it! Use a sleep tracking app to measure your sleep duration and quality then identify factors that improve it. I was able to identify that red wine helps me fall asleep more quickly but it reduces my sleep quality and duration. I confirmed much to my dismay that avoiding screens in the hour before bed dramatically improves both my sleep quality and duration. It is easier to sleep in the spring, fall and winter than mid-summer due to long days. Cover your bedroom windows with foil or install light blocking curtains to darken your bedroom and help extend your sleep time. After you have taken care of the big two, nutrition and sleep, there are many accessory recovery techniques to add to your routine; stress reduction, massage, compression, active recovery, stretching, foam rolling, yoga, meditation, acupuncture, rolfing, cupping, cryotherapy, hydrotherapy, sauna, dry needling, supplements such as tart cherry juice, and more. Stress reduction is one of the more important accessory recovery techniques. Trying to add too many accessory recovery techniques on top of an already busy schedule may add stress and be counterproductive. Pick a few accessory recovery techniques you enjoy and have easy access to, rather than trying to fit every single one of them into your schedule. For example, dipping your nightly sleep time below 8 hours to log 30 minutes in the sauna is not a good trade off. We are all busy. A common mistake many athletes make is to use their rest days to run endless errands and their recovery weeks to tackle bigger projects. One of my athletes built a deck behind his house in a recovery week! He ended the week sore and exhausted and we had to follow that week up with another recovery week in order for any quality training to get done. On your rest days and recovery weeks, plan massages and lots of downtime, put your feet up and really unload fatigue. Recover as hard as you train. Eat well, sleep well and recover fast because your competitors probably are doing it!